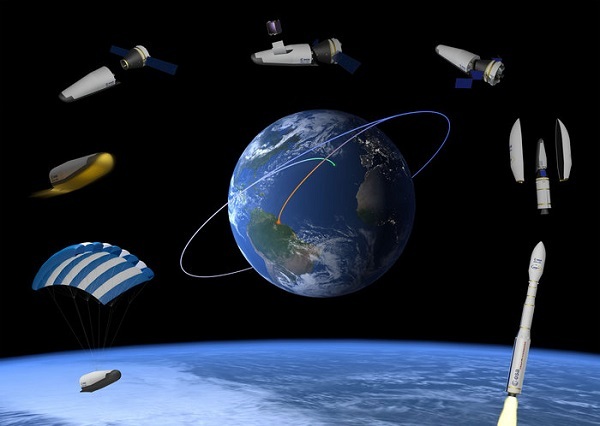 PARIS (ESA PR) — ESA’s Space Rider aims to provide Europe with an affordable, independent, reusable end-to-end space transportation system integrated with Vega-C, for routine access and return from low Earth orbit. Space Rider will debut in 2021 to provide a laboratory in space for an array of applications, orbit altitudes and inclinations. ESA has released a dedicated Announcement of Opportunity with no restriction on nationality for commercial or institutional customers. A multi-purpose cargo bay equipped with standardised but customisable interfaces for the payloads offers a high-tech platform for experiments in space on missions expected to last up to two months or longer if needed. Customers assisted by the Space Rider telemetry and command services will be able to upload and download commands and data at each orbital pass. On completion of the missions, Space Rider will return to Earth with the payloads stowed in its cargo bay to land on ground in European territory. The vehicle will be reusable following refurbishment after each flight. surveillance applications such as Earth disaster monitoring, satellites inspection. For further information related to this announcement of opportunity, open the folder ‘News’ after clicking here. Great News, finally seeing ARD and IXV evolving into something tangible and actually useful. Europe should benefit with this new tech and assured independent access to such a space lab; other scientific groups and tech companies from all over the world should be happy with this opportunity as well. Hopefully it will further spur the tech market and science.